In Dallas-Fort Worth International Airport (DFW), proceed to Terminal B, we are located next to the gate B23, just after the security check. Welcome to Be Relax Dallas ! Greetings! As Be Relax DFW General Manager, I have over 25 years in the Health, Beauty, and Wellness field of work. I am a Massage Therapist, and a Cosmetologist. With all the expert DFW Be Relax team, we have a passion for healing and harmonizing the Mind and Body. 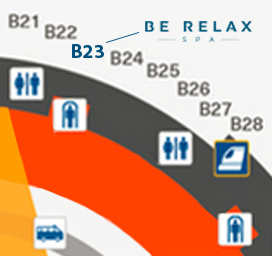 We look forward to welcoming you and making you experience the Ultimate Be Relax Experience at DFW Terminal B Gate B23!